Ontario ATV Trail Riding Adventure! From idyllic rivers and lakes to pristine forests and gorgeous meadows, Northern Ontario is the destination for ATV excursions. Come and see the wildlife and breathe in the exhilaration of your journey in a portion of nature still largely untouched by the hands of man. The province of Northern Ontario is one of the most beautiful places in the world; a place where fishermen, hunters and vacationers travel great distances to relax and get away from the hustle and bustle of the city. ATVing through this marvelous wilderness is one of the most unique experiences that you can have on your next vacation. With a wide network of trails that will lead you from cool, scenic lakes through dense forests and everywhere in between. Ontario has a multitude of events and clubs for those looking for some company on their ride. There are even guided tours for those who would like a little bit more information about the beautiful area that they’re experiencing. With our one of a kind ATV vacations, you can have the kind of experience you want. Whether you’re looking for the thrill of a windy trail with an unparalleled backdrop, or looking for a more leisurely ride where you can learn more about the area, or simply be closer to nature, we can accommodate you. So often in our lives, we get overwhelmed with everything that’s going on around us. You have that meeting to worry about, that co-worker is grating on your nerves, life’s too busy, and it would just be so nice to get away. Come give our world-class trails a go, and you’ll find the stress of everyday living back in your dust as you explore the body of nature. 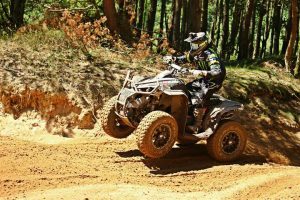 The joy of ATVing is something that is in our blood, and what better way to see the countryside than on the back of an all-terrain vehicle? Reach spots you can only imagine from a car, get closer to the wilderness and marvel at how it takes your breath away or simply enjoy a much-needed getaway with friends or family as you travel through some of the finest real-estate on the planet. Ride your way into the wild blue yonder with your friends, family or that special someone, and let the scenery take you in, relax you and bring you closer together. Whether your ride for a day or for a week, you’ll find excitement at every turn, hand-in-hand with the serenity of the area. When people talk about world-class outdoor vacations, Northern Ontario is always at the top of the list, and we look forward to showing you why this province is one of Canada’s national treasures. So come and let us help you on your way to a vacation that you will never forget. Whether you go for a slow ride through the wilderness to breathe in nature and spot wildlife, or a more fast-paced jaunt through hills and valleys, through forests, lakes and rivers, you’re bound to find adventures that will sooth your soul, invigorate your body and refresh your mind.